The Precision Digital Negatives eBook in PDF format, Curve Calculator I Excel Spreadsheet, and Calibration Palettes. A totally NEW version of Curve Calculator with many many New Exciting Features! Much easier to use with redesigned interface. Works with Snow Leopard, Lion, Mountain Lion, and Mavericks. Assists you with your Calibrations and helps you evaluate them. 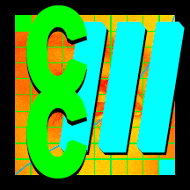 Curve Calculator is a Standalone Database Program for performing and storing Calibrations for Precision Digital Negatives. Compares printing variables by graphing for better analysis. Produces a curve families with varying contrasts for your alt processes. Exports curve files for easy import into Photoshop. Store all your calibrations in one place. New digital 21 step Tonal Palette included. Built in Help Files. NOTE: Precision Digital Negatives eBook & film 31 step tablet required to use this product. Precision Digital Negatives Aquatint Screens for Photopolymer Gravure and Copper Plate Photogravure. I spent a year doing research and development of these screens and derived a method that enhances deep rich blacks, produces a very long tonal scale, produces very smooth tonal transitions or large areas of similar tone, and yields very fine detail. These stochastic, or random dot screens, are printed on film and are immaculate, with no artifacts or streaking. They are the best screens I have ever used and a number of master print makers are saying they have never had a better aquatint screen for either Photopolymer Gravure or Copper Plate Photogravure. I recommend starting with the Medium screen. Screens may be used for any type of images, not just photographic images, where you wish an aquatint for intaglio printing. Fine Resolution—This screen has the finest stochastic random dot pattern and produces a lower contrast plate/print. Medium Resolution— This screen has a medium stochastic random dot pattern and produces an average contrast plate/print. This is a good all around choice and my favorite. Coarse Resolution— This screen has the most coarse stochastic random dot pattern and produces the highest contrast plate/print. Prices are determined by size of screen, not by resolution. All screens are shipped with a tracking number and insured. Screens are not returnable. Screens are marked with size and resolution and have a small clear border for registration with the plate and handling. Clean screens as you would a photo negative. Screens may be used for any type of images, not just photographic images, where you wish an aquatint for intaglio printing. A 31 Step Tablet with 31 steps of 1/3 stop each up to Log 3.0 transmission density. This step tablet, designed by Mark Nelson, has many nice features that make it easier to work with the PDN calibration. A 31 Step Tablet provides a bit more accuracy than a 21 Step Tablet. The step tablet is produced for PDN by Stouffer Industries.